CSS collaborated with NOAA's National Centers for Coastal Ocean Sciences, Center for Coastal Monitoring and Assessment to assess the ecological resources of Jobos Bay, PR. The study's primary objective was to establish baseline values for the distribution of habitats, nutrients, contaminants, fish, and benthic communities. 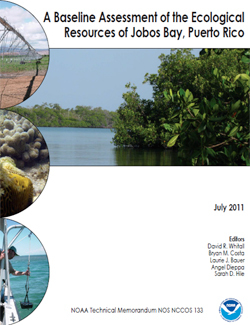 CSS scientists created a new benthic habitat map of Jobos Bay using imagery processing, delineation of benthic habitats in ArcGIS, field data collection, and development of an online viewer of the habitat maps. We also characterized the fish and benthic communities in the Jobos Bay region, designing the sampling strategy and carrying out data collection, analysis, and interpretation, among other tasks. CSS authored two of the chapters in the final Baseline Assessment Report, and produced and edited the final technical memorandum. The Baseline Assessment was one component of the Conservation Effects Assessment Project (CEAP), a multi-agency effort to quantify the environmental benefits of conservation practices used by agricultural producers participating in selected U.S. Department of Agriculture (USDA) conservation programs.